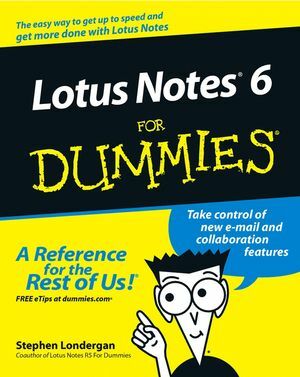 Lotus Notes For Dummies helps readers navigate and employ Lotus Notes to improve productivity and efficiency. Covers the enhanced features of the new version of Lotus Notes including the welcome page, instant messaging, document sharing, calendaring, group scheduling, and going mobile. This is an introductory level book that provides the essential information needed to enable users to get the most from the latest release of Lotus Notes. Stephen Londergan works for IBM, where he is a member of the Lotus Notes collaboration team. He is also the coauthor of all the previous For Dummies books on Lotus Notes. PART I: GET ROLLING WITH NOTES. Chapter 1: Just What Is Notes, Anyway? Chapter 2: Getting Acquainted with Notes. PART II: IT'S A MAIL THING. Chapter 3: Gotta Get My E-Mail. Chapter 4: Making a Message. Chapter 5: Managing Your Mess(ages). Chapter 6: Making the Most of Your Messages. Chapter 7: Mastering Your Mail. PART III: WHEN IT'S NOT A MAIL THING. Chapter 9: Managing Your Calendar. Chapter 10: Tracking Your To Dos. Chapter 11: Your Personal Address Book. PART IV: MAKING NOTES SUIT YOU! Chapter 14: Jazzing Up Your Text. Chapter 15: Doctoring Your Documents. Chapter 16: Notes the Way You Want It. Chapter 17: Data In and Data Out. Chapter 18: Notes and the Web. Chapter 19: Notes for Road Warriors. Chapter 20: Ten Things You Should Never Do. Chapter 21: The Ten Most Common Lotus Notes Problems. Chapter 22: The Ten New Things You Should Know About Lotus Notes 6.